Cai is an international Recording Artiste and Model. He has is own successful solo Show called The Power Within and also 3 Studio albums.. over the years Cai has worked with some of the best singers/producers in the business and has an original solo album which he co- wrote and produced. One of the ballads on his very first studio album reached the top ten single charts (more info). Many of his songs have had radio play and been heard around nightclubs & venues all over the UK and internationally. 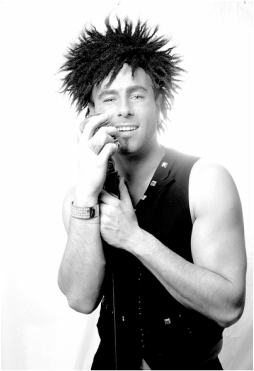 Cai has been performing and entertaining audiences for over a decade with his amazing vocals and image. His work over the years has taken him as far as South Africa, Italy, Greece but to name a few. Cai has performed in all types of venue's from Theatre, Casino's, Hotels, Corporate Events, Main Stage Mardi Gras and is a regular household name on the Welsh Clubland Circuit. This amazing show can still be booked now. Cai was also resident entertainer for Warner Holme Lacy House Hotel - were he sang songs from the West end And played the lead Phantom, in Phantom of the Opera. During his time there Cai worked with the stars of BBC's Strictly Come Dancing team.. this was a great experience and a highlight for Cai. Cai also has a major passion for modelling and has appeared at many catwalk shows and in many fashion magazines.. and on some he made the front cover! He says as his experience grows his love for music, fashion and modelling has not changed if anything become even stronger! Over the years Cai has evolved as artiste and hopes he has changed for the better!, Cai likes to always be different, set trends never follow .. he believes image is the 1st thing that an audience judge you on and after all you eat with your eyes. He likes to keep people interested in every show and gives 100% in his performances and through his belief in learning, listening and confidence... he guarantees these qualities will always pay off, leaving his audience - wanting more. Music and Modelling are his life. A rare unique entertainer who has it all, a natural with great range, stage presence, he is a real Power House! Wales next big thing up there with the talents and vocally compared to by the likes of Tom Jones, Shirley Bassey, Josh Groben, George Michael. His musical influences are Keyshia Cole, Mary J Blige, Mariah Carey, Prince, Boys2men, Ne-yo, Sade, Jill Scott, Brandy, Toni Braxton and Amy Winehouse. He has met many celebrities one of whom was Sir Andrew Lloyd Webber, where he sang and performed in the millennium stadium. Cai was cast and stared in a show called WEST-END v BROADWAY on here you can see him perform songs from this.